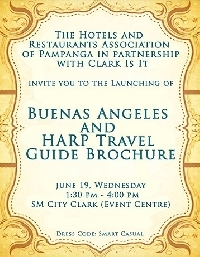 The Department of Tourism – Region III announces the conduct of a 3-in-1 event onstage at the SM City Clark in Pampanga on June 19, 2013, Wednesday, 1:30 p.m. to 5:00 p.m.
3) launching of the www.clarkisit.com or a corporate-social-responsibility portal under the umbrella organization called Peregrine Development, Inc. that aims to digitize information relating to Clark and the whole of Angeles City including nearby towns and cities, thus giving the tourism public the power to manage their tour itinerary while in Clark and its environs (where to stay, where to dine and what to do). The Department of Trade and Industry is also expected to mount their project with the members of HARP in relation to the setting up of a One-Town-One-Product (OTOP) program whereby each hotel and restaurant in Pampanga is bound to display in their lobby the region’s indigenous product line. The invitation is open to the public. Maligayang Kaarawan Po Sa Inyo Inay!